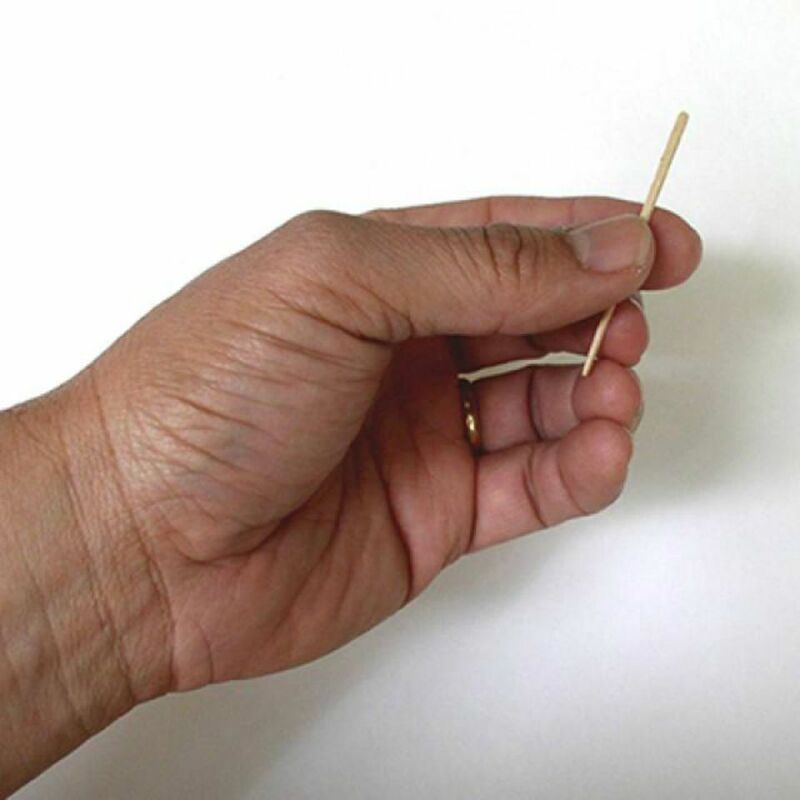 In this easy magic trick, you cause a toothpick that you're holding in your hand to vanish in a flash. At the end, you're holding your fingers wide apart. Learn the Vanishing Toothpick by watching our video here. For more video lessons, please subscribe to our video channel. There is also a second method to vanish a toothpick you can learn. Materials: A toothpick and a finger ring that's worn on your third (ring) finger. Secret: The toothpick is secretly held by the finger ring behind your hand where it can't be seen. Starting Position: Hold the toothpick in your hand as in the picture. Your thumb is holding the middle to upper portion of the toothpick. After reading all of the instructions, you will probably want to experiment with the placement of your thumb so it best suits you. Notice how the ring and little fingers are bent in. Interested in learning the latest magic tricks? Follow us on Facebook and Twitter. Using your thumb, push the bottom end of the toothpick between your middle and ring fingers and into the finger ring. It helps if you move your hand slowly up and down to help cover this action. Please view the next picture to see what is happening behind your hand. This view from the back shows how your thumb feeds the toothpick into the finger ring. With the entire tooth pick pushed through and behind your hand, briefly hold your thumb over the divide between your middle and ring finger. At this stage, make sure that the toothpick is completely behind your hand and securely held by the finger ring. Open your hand and keep your fingers together. Open your fingers so they are wide apart. This shows the location of the toothpick behind your hand that your audience doesn't see. It's very important when performing this close-up effect to watch your angle. This trick is rather angle sensitive and you will want your audience in front of you. This effects fits into the category of a vanish. What you are doing is making an object disappear. In this trick, you are vanishing a toothpick and it's gone for good. You don't bring it back. In many magic tricks, the magician makes an object disappear and then brings it back ("reproduces" it). One method that employs rings but allows you vanish and then reproduce a coin is a great trick. This one requires some arts and crafts ahead of time, but the results are lots of fun and it's an easy trick to learn and perform. While a toothpick is a convenient object to vanish using this method, you can use other objects such as matchsticks. You'll have to experiment to see how the other objects work. Of course, the objects will have to be small and fit into a ring as you are wearing it, which effectively limits the objects that you will be able to work with and vanish. If you are interested in vanishing objects, there are several effects with coins that we teach that will allow you to do so. You'll find several methods to vanish a coin here. As you can see, there are a lot of diabolical methods that are available for you to employ.